For my first food cart stop of the season, I wanted to go somewhere special that offered food I had been craving the whole winter season. 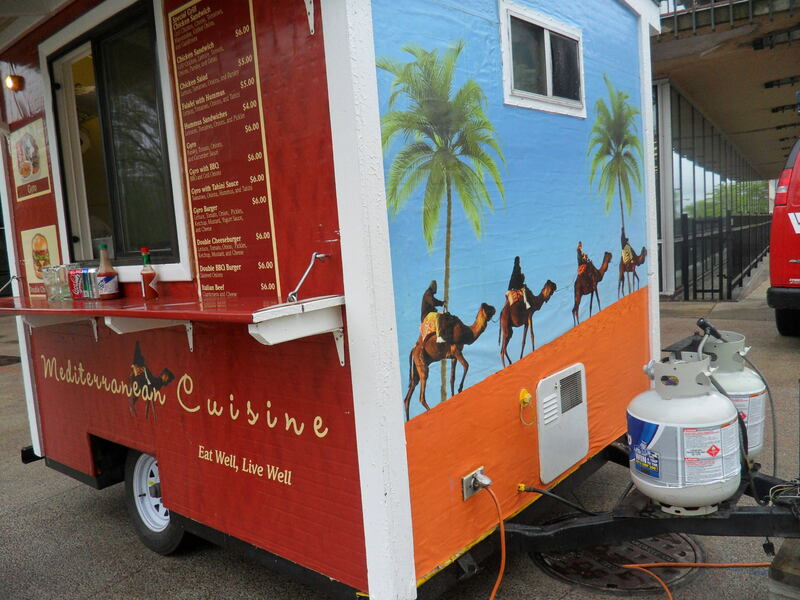 Instead, I went to the mobile eatery located closest to my house. In my defense, it was raining. I approached the King of Falafel cart on the Capitol Square and expected to be in for treat. I eavesdropped on overheard the conversation that the lady in front of me was having with the cook. She revealed she was a coveted member of the food cart review committee. Group members eat food from every single cart for a week each September and their scores determine where the carts will be located the next season. She told the cook she “loves the food here.” I smiled to myself and prepared to bite into a delicious lunch – if someone who has eaten every item from every cart likes this place, it must be incredible. I ordered the standard gyro but substituted chicken for lamb. After a wait of about three minutes, I was handed a Styrofoam box, plastic fork and tiny piece of napkin. 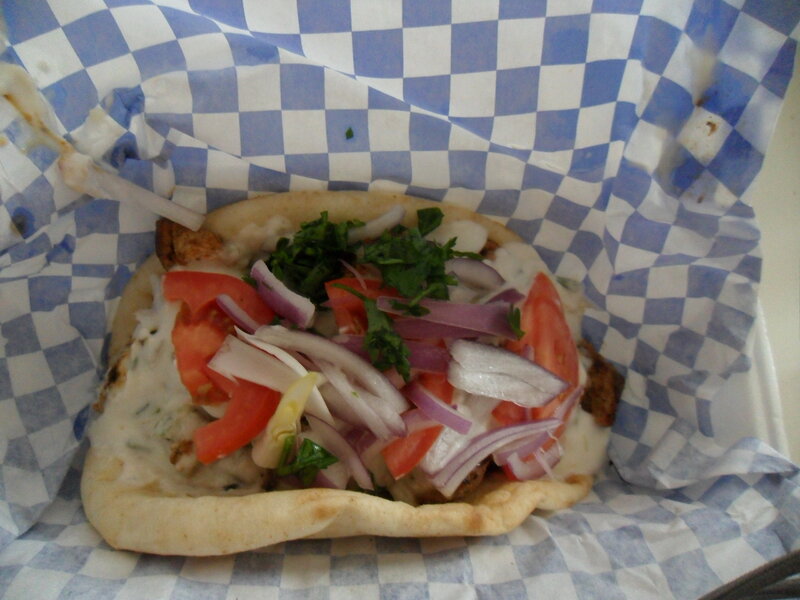 At first peek, I assumed the $6 gyro was overpriced for what I would be served. Wrong. This pita had some weight to it and it was chock full of piles of meat, onions, tomatoes, parsley and, most importantly, the Greek staple of tzatziki sauce. Thankfully, I ate the meal in the privacy of my own home. That scrap of paper towel and plastic fork were not going to cut it. Chucks fell out of pita when I picked it up and sauce was running everywhere. A metal fork and at least three napkins were needed for this job. After all the work, the gyro was disappointing. The chicken wasn’t great – it almost had a peanut-like taste to it. The cucumber sauce didn’t have any flavor. The rest of it was OK but some raw onions, cut up tomatoes and cold pita do not make for a satisfying meal. I would give Mediterranean Cuisine another shot but I would not make any substitutions. And I would ask for more napkins. I liked their spinach pie when I tried it. Their gyros is run-of-the-mill decent and good in a pinch. I’ll have to give the spinach pie a try – thanks for the suggestion! Oh no sounds like not the best experience! Hopefully China Cottage will make you feel better! Great review you guys rock! Thanks Brenda! We appreciate the support. 2cnb.blogspot.com for life. quality writeup miss bender. i love the honest, hard-hitting take on madtown’s food stand delicacies right off-the-bat. its not all cotton candy lollipops and cuddly magenta unicorns. i’ll be keeping close tabs on you women street eaters as DCFCE’s #1 fan! You’re getting hard-hitting journalism with all the facts from your Madison Streeteaters summatimeballin’. Thanks for being a fan!